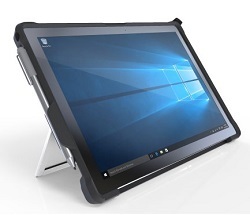 This case surrounds the Surface Pro or Surface Pro 4 in military-grade drop protection with an integrated hand strap for worry-free carrying. The Type Cover can be easily attached or detached with the case on, and a strategic cutout preserves full functionality of the Surface kick stand. Microsoft Surface Pro 4 shown in image is not included.